The Milwaukee Brewers may not be playing in October, though thousands of fans will continue to make their way into Miller Park seating areas until the end of the regular season. Rated as one of the best venues in the sport, the diamond has consistent good weather with a unique retractable roof and ample seating for over 40,000 fans. From general admission nose-bleeds to group business suites, every patron at Miller Park can find their spot. Sections 404 to 442 represent the most economical terrace seating. Boxes and individual reserved seats are available to fans in these sections, as is Bernie's Terrace, which provides the best view of the mascot's famous homerun slide. All even-numbered 400-level sections are handicap accessible. Fans looking to get a little closer to the action can take advantage of the well-priced club-boxes. Located on the 300-level, outfield and infield club-boxes are listed at the same face-value, though infield boxes do offer wait staff. The all-inclusive NYCE Stadium Club and the Gehl Club serve meals and drinks to the club-box sections, and also provide lounge areas for appropriate ticket holders. Miller Park's party suites are also located on the 300-level. The only 300-level handicapped seating is in the 309, 324, and 335 sections. Five other all-inclusive areas are situated throughout the complex. All but the Toyota Territory provide fans with a private buffet and two free drinks during the game, as well as exclusive entrances and other amenities. The Dew Deck, the ATI Club, the Toyota Territory, and the Miller Lite Party Deck are located beyond right-field among sections 101-104 and 201-205. Space for more than 400 people is available between the four areas. The Harley-Davidson Deck seats 42 fans on an open-style patio in left-field. The area includes all the amenities present at its fellow all-inclusive sites, as well as parking-passes for any motorcycles in the group. All of the all-inclusive areas are handicap accessible. Returning to the general-admission seating, the 200-level offers attendees four loge-seating options. Loge bleachers in sections 201-205 and 233-238, outfield-boxes in sections 206-209 and 228-232, infield-boxes in sections 210-227, and loge diamond boxes which are designated as the first rows in the infield-box sections. 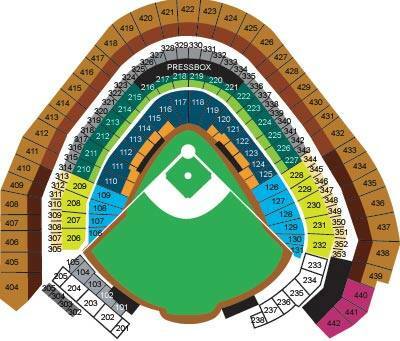 The 200-level is the most wheelchair accessible area of Miller Park, with only sections 207, 210, 213, 215-219, 222, 224, 229, 231, and 236-237 as exceptions. Perhaps willing to break the bank a bit for your Brewers experience? Then the field-level seats are for you. Like the loge-seating, the field-level provides bleacher, infield, outfield, and diamond box areas in the 100 sections. Field bleachers pricing is featured behind right-field in sections 101-104. Outfield-boxes straddle the warning track on the left and right sides of the diamond, taking up sections 106-109 and 126-131. Infield-boxes and diamond boxes again share sections in the 100-level, residing directly behind both the dugouts and home plate in sections 110-125.